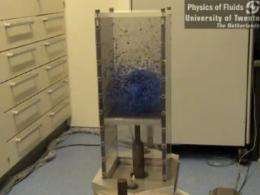 This image from the video below shows the machine that uses bouncing beads to perform work, confirming a thought experiment from 1912. Credit: University of Twente. (PhysOrg.com) -- By building a machine that uses 2,000 bouncing beads to spin a paddle and perform work, researchers from the University of Twente have finally realized a long-debated thought experiment. A similar machine was first proposed in 1912 by the Polish physicist Marian Smoluchowski. In his thought experiment, he suggested that tiny moving particles could generate enough force to spin a windmill-type paddle. A locking mechanism such as a pawl could prevent backward motion, forcing the wheel to move in the forward direction only. However, several years later, physicist Richard Feynman argued that, in reality, the bouncing beads would not be capable of doing meaningful work. Feynman showed that, since the entire system operates at the same temperature, a pawl would occasionally slip off the wheel. As a result, the system would generate zero net movement. Now, physicist Devaraj van der Meer from the University of Twente and his colleagues have demonstrated that such a machine can in fact spin the paddles forward only, generating a positive net movement. The details of their study will be published in an upcoming issue of Physical Review Letters. Looking somewhat like a high-speed lotto machine, the new system consists of a vigorously shaken platform that causes 2,000 small glass beads to bounce around. When the beads make contact with the vanes of a windmill-like device inside the machine, the vanes move, turning a rod, which rotates a sensor. In this machine, 2,000 bouncing beads spin the vanes of a ratchet. Credit: University of Twente. The key challenge was getting the vanes to move in the forward direction only, which the scientists achieved with - somewhat surprisingly - duct tape. With duct tape covering one side of each vane, the vanes spun in one direction only. Since the beads lost more energy when they hit the soft duct-taped side than the non-taped side of the vanes, the machine generated a positive net movement. Van der Meer noted that the machine doesn’t come close to violating the second law of thermodynamics, since the system is extremely inefficient. Most of the beads’ energy is lost through heat and sound. However, the system could still provide scientists with insight into classical mechanics. For instance, the system exhibits a property called back interaction, so that not only do the beads move the vanes, but the vanes also move the beads. After the vanes begin to turn in one direction, the researchers observed a new roiling pattern in the beads. The physicists say this back interaction might also occur in tiny “molecular ratchets,” which include molecules in the body such as RNA polymerase and protein kinesin. At much smaller scales, these molecules move themselves through the body by ratcheting along tracks inside cells. The macroscopic system built here could help researchers better understand how molecular ratchets work by allowing the researchers to observe and manipulate the interactions on a large scale. Ahhh...duct tape. It's like violence. If it doesn't work: use more. It is a test that basically says that you can get useful work out of a system wich is very close to maxium entropy. This is huge. It could spell the beginning of drawing power out of ambient air. Certainly not a _lot_ of power but maybe enough to power basic sensors. Think about your phone recharging itself by simply sitting on your desk - without any solar panels or whatnot. I think that a common theory is that random chaotic movement can not do work. A team of sled dogs pulling equally in every direct results a sled going nowhere (no work, and all the energy or movement basically amounting to zero). The majority of sled-dogs need to move in the basic same direct in order for the sled to move in a useful direct (work). The experiment shows that if you tweak chaos, you can get work or directed-energy. This experiment also showed that the directed energy also effected the general mass of chaos so that it began to move in a more useful and less chaotic way. I think that is what this is about. Is not thermocouple energy free energy that exists everywhere? Also, Maxwells Demon experiment is years away from being proven correct! No the power from a thermocouple comes from the temperature differential between the hot and the cold junction. If only we could find a real of duct tape small enough! Not really, as a Crookes radiometer does not include a pawl mechanism and also depends on different thermodynamic properties of regions ('cold' side vs. 'hot' side). In the above experiment both sides of the vanes are, on average, in a therodynamically equivalent state. Why would thermocouple voltage not be considered free energy? I agree with antialias this is huge. This could explain life the universe and everything. In a random universe it gives a mechanism for choice awesome. Because it requires an external energy source to maintain (or at least establish) the temperature gradient in the first place. Don't forget, thermocouples have a cold junction you rarely if ever see (inside the equipment). Read up on the Seebeck effect for details. This article erroneously implies Feynman said this machine could not work. Feynman was referring to Maxwell's Demon, and this machine is certainly NOT Maxwell's demon, even in spirit. This machine demonstrates no reduction in entropy, nor does it demonstrate free energy (as would a machine that demonstrates Maxwell's demon, at least in spirit). The machine is a simple engine converting random mechanical energy to rotational mechanical energy. I wonder if the error is in the journalism or the original work. It may only be a semantic distinction, but this sounds like it is the establishing of an equilibrium state, based on the average frequency and force of impulse being transferred by impact of individual beads, and the patterning of the beads' motion is just the feedback loop of bead motion parameters being constrained(interference pattern). Not saying it doesn't work, but either the article author or the physorg translation sounds unecessarily mysterious- at least to me. Now all we need is a way to apply this to vacuum energy, and we should be home free. why the hell would the machine violate the 2nd law of thermodynamics when its CRYSTAL CLEAR that there is a LOT OF EXTERNAL ENERGY INPUT IN THE SYSTEM??? I mean, all that vibration that makes the beads fly in the air is clearly caused by an external motor!! The only way to violate it would be if the glass beads, when rotating the "windmill" fueled the own vibration that made them jump in the air. This is CLEARLY NOT THE CASE. You truly live up to your hype. Bravo yet again my old friend, you never cease to amaze. Would this system be more efficient if the interior of the glass case was a vaccum? To those who say that this is something "big" - I'm affraid I have to dissapoint you.. There is no energy extraction from random chaotic motion happening in this experiment, as the here applied mechanism quite horribly fails to emulate unbiased random chaotic motion in the first place. Although there is kinetic energy transfer happening, it is indeed only by the effect of gravity coupled with the asymetrical nature of the "chaos generator", that non-zero net directivity is achieved. Thermocouple voltage is created mainly by thermopower, however thermocouple voltage can be detected in some cases by using a multimeter in conjunction with a magnet. There is no temperature differential that I am aware of when using a magnet. Maybe the copper wires with maybe nickel and other alloys along with the magnet is creating the thermocouple voltage? I spoke with an electrical engineer about the mystery voltage and the engineer said it was created by thermocouple energy. Seems like common sense it would would by watching the video. Actually, Crookes radiometer works (i.e. rotates) even inside of hot oven with omni-directional source of heat. The pawl mechanism seems not quite necessary for me in this connection, because the orientation of surface with duck tape covering the paddles defines the direction of rotation in sufficient way. The orientation of paddle cannot be in contradiction with orientation of pawl mechanism, or the device wouldn't run. Anyway, it's evident, this device doesn't work as a Maxwell's demon. The Demon uses energy to open and close the door AND to process information. Someone managed to prove the information processing would increase entropy as fast as the Demon could lower it by opening and shutting the door. Found a link covering this. and then click on the conclusion. Here's to Lisa Zyga the hoaxer, once again generating controversy over mere nothing. Excuse for several copies. Got an alert message could not be posted due to XML-parsing violation ... That said you can of course say a "pawl" creates 100% friction in one direction and 0% in the other. Feynman's statement is based on "ideal" conditions. Given this machine was "ideal" in all its parts, the "bead-generator" included, but duct tape excluded, the tape introduces an "non-ideal" imbalance, favouring the movement-energy transferred from the beads to the vanes, in such a way that the movement goes in one direction. So of course the heading of this article is a "reader catcher"
Actually, the placing duck tape on the paddles makes the whole experiment "Feynman invariant". By touching probes to the leads you create cold junctions. Magnetic fields are known to change Seebeck coefficients. I'm gonna go out on a limb here and say the temperature of your magnet is not exactly the same as your meter connections. The presence of voltage tells you so! A key feature of the Feynman-Smoluchowski ratchet is that it is operated at a single temperature. However, a system of strongly vertically shaken granular matter, such as that used in this demonstration, exhibits behavior characteristic of a fluid that is heated at the bottom and cooled at the top, and is thus not at a single temperature. This has been shown experimentally by Devaraj van der Meer (the inventor of the demonstration) et al. in their recently published paper, "Onset of Convection in Strongly Shaken Granular Matter" (Physical Review Letters 104, 038001 (2010). Given that the shaken beads in Devaraj van der Meer's machines behave collectively like a fluid heated at the bottom and cooled at the top, so that the system demonstrated here can not be said to operate at a single temperature, nor be analogous to a system that is operated at a single temperature, I question its relevance to the Feynman-Smoluchowski ratchet. It makes sense what you said about the mystery voltage. There was an article in Physorg.com that talked about the Maxwell Demon thought experiment and how it could be correct without violating the 2nd Law of Thermodynamics. The article was titled: Could Maxwell's Demon Exist in Nanoscale Systems? June 24, 2009 by Lisa Zyga. I believe the concept was based on quantum fluctuations in the nanoscale. After thinking about all of these free energy perpetual motion machines I think one will find that another energy source of some sort will be needed to fuel the machine thereby negating the thought experiments. However, after saying that I believe our universe is no less than a free lunch, which means there is a such thing as a free lunch!!! A key feature of the Feynman-Smoluchowski ratchet is that it is operated at a single temperature. However, a system of strongly vertically shaken granular matter, such as that used in this demonstration, exhibits behavior characteristic of a fluid that is heated at the bottom and cooled at the top, and is thus not at a single temperature. The problem is, beads are bouncing from paddles covered with duct tape in smaller speed - this violates the single temperature requirement of Feynman model, not the thermal gradient, which is orthogonal to plane of rotation. This article does a terrible job at describing the science behind this news. No, this is not the model of the original thought experiment and no, it does not prove that Feynman was wrong. The whole point of the original thought experiment is extraction of work from *gas* at thermal equilibrium! The model described in the article has absolutely no bearing on that problem as it extracts work from glass beads which everyone knows is possible. Their work will be relevant and newsworthy once they show a nanoscale version of their contraption true to the original thought experiment, but don't hold your breath as it would violate the 2nd law of thermodynamics (unlike the current version). Red Green is so happy right now. A thermocouple has 2 wires of dissimilar metal are joined together at the proposed hot end of the device. The best (most accurate) are created using vastly dissimilar metals such as iron and platinum and this is indeed the combination for the part of a kiln that needs most accurate control (tunnel kilns have multiple devices). This joined end is encased in a protective shielding and lowered through a hole in the kiln roof. Putting any voltmeter across the open end produces a reading which can be calibrated to an associated temperature. I believe the principle is that the molecular vibration in the different metals relates to the particular metal. This being different in the two wires creates a current flow. You would also get a voltage if the joined end was stuck in an orange or apple. If this can be done with grains of rice, then I want it to power a Honda. Does this finding mean, that it is possible to extract work from Brownian motion in gases or water? No, you have to invest into source of vibrations first. The above device works only because there is energy density gradient. But the gradient is not one that has an angular moment - so the gradient in the experiment is irrelevant. It would also work without a gradient as long as the number of paticles is small. Yes. The idea is that brownian motion does result - on occasion - in local gradients just by sheer random chance. The device turns because it reacts to such gradients in one direction but not in the other (by the pawl mechanism). Absolutely right. Exacty. It's a nice visual, but really amounts to extracting energy from gravity. There is no true random motion. There is always the added bias of gravity. Each bead takes a curved path, all the paths bias downward. The paddle takes advantage of gravity's downward bias. Try in zero gravity = fail. Am I misunderstanding the whole article? I see the bouncing beads as only a simulation of chaotic energy - not as a fundamental energy source which is always present. The problem being to get the chaotic force to operate in a controlled and directional manner (something of an oxymoron to express.) The duct tape absorbs some of the contrary motion and so the wheel overcomes the natural, entropic friction and wheel turns. VOILA! The beads are just a means of supplying this chaos - not seriously intended as a permanent source, of course, there are serious outside energy additions, but they are not salient to the experiment. So yeah chuck a couple of these in still air to generate windless power! That doesn't work because the number of particles hitting both sides is, on average, the same. Also the gradients that come into existence momentarily through random fluctuations are too small to overcome the friction of the system. HOWEVER, if you go to the nanoscale then the number of particles become small and the RELATIVE gradients can become very large. Here such a system can work if it can capitalize on the random gradients fast enough. No duh, water molecules spin acording to the earth's affects in a whirlpool. These beads are "falling" like water down a drain. They go up random by a hard close push but come back down in the field. That is elementary school stuff. That effect is negligible for small systems. That toilets flush in a different direction on the north and south hemispheres is an urban myth. Even so: the orientation in the experiment is perpendicular to any coriolis force so _even if_ the balls were deflected this would have no impact on the direction of rotation.